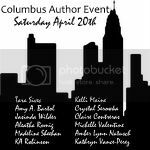 We are getting ready for the 2013 Columbus book signing, author event. It will be hosted at The Westin, Columbus. This event is completely free and open to the public and will feature several best selling independent and published authors. Books will be available for purchase and signing. If you're planning on attending this amazing event, please register. Events By us is directing the Wedding and we could not be more excited! our Venue will host our event and we are honored to have an amazing group of special guests will have the opportunity to see at work! So, Save the Date!